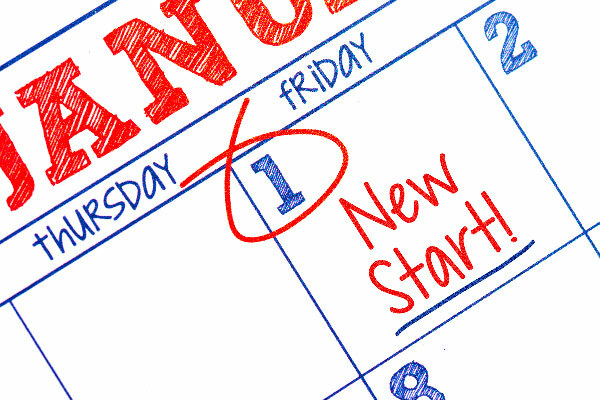 Why do so many New Year’s Resolutions seem like punishments? Lose weight, spend less, exercise at least one hour every day. No wonder most of us have given up on our January 1st goals by April! The best New Year’s resolutions are aimed at making our lives better — more joyful. Here are some ideas to get you started on a great new year! Get out of a rut. Studies show that doing some part of your daily routine differently, whether it’s changing your route to work or opening the door with your left instead of right hand, can boost your creativity. It can’t hurt to try it! Say “no.” People think of you as a person who knows how to get things done, so they ask you to help out. But you don’t always have to say “yes,” especially if you’re feeling overscheduled. You’ll be surprised how much people won’t hate you for it. Smile more. (Especially when you’re saying “no” to someone!) Psychological studies indicate it will brighten your outlook. Schedule relentlessly. Whether you use a scheduling app or an old-fashioned paper calendar, writing (or typing) everything down will help you feel — and be —more in-control of your time. 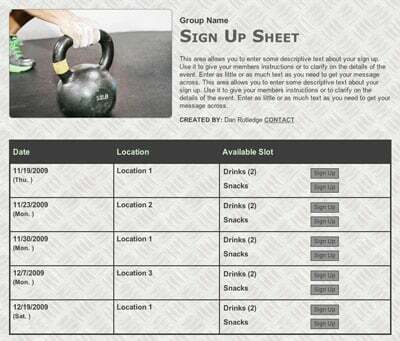 Genius tip: Plan your big events with an online sign up and stay up to date on the go with SignUpGenius mobile. Stop being late. It makes you look unprofessional. The key is to figure out why you’re never on time, and fix it. Stop procrastinating. Break a task down into several smaller steps. Then reward yourself after completing each step. Stop worrying. It’s OK to be concerned, but worrying — or ruminating — can cause more harm than good. There are many strategies for reducing your worrying, such as meditating or journaling. Pick one and try it. Stop reacting. In the social media world of instantaneous opinion sharing, this can be tough. Resist the urge to lash out, and take a deep breath or two before you respond to something that might upset you. Stop being negative. It’s widely accepted that persistent negative thoughts can have a negative impact on our lives. There are plenty of books, articles and websites you can read on how to turn them around. Simply being aware of your negative thoughts is a start. Take a chance. A new year is a great time to do something you’ve always wanted to try, but were too scared. Dye your hair, jump out of an airplane, introduce yourself to someone new. Learn to meditate. It’s simpler than you think. And it can really help with those negative thoughts. Entertain at your home. It does not matter if your home is spotless. Just do it! It’s a great way to turn an acquaintance into a friend. Learn to cook a foreign cuisine. And invite people to your home to try it! Meet new people. If you can’t think of anyone to invite over to try your foreign cuisine, try an exercise or other hobby group, churches or volunteer organization. They are great places to look for a new friend. Organize your photos. Delete all those extra photos you took while trying to get the perfect shot. Actually print off a few that you love and put them in an old-fashioned photo album! Check your emergency kit to make sure everything is still in working order. Don't have one? Now’s the perfect time to gather an emergency kit of supplies you will need in the event of a disaster. Clean out your closet. According to the experts, you only use 20 percent of your wardrobe. Up your percentage by donating at least some of the clothes you’re never going to wear again to charity! Get out of debt. The average American household owes more than $7,000 in credit card debt, so this one could take more than just one year. How about picking one credit card and working down the debt in 2016? Keep a personal journal. Everyone seems to be sharing everything online lately. How about writing down your thoughts every few days or so, just for you? Learn a new language. If you take a group course, you could meet new friends with similar interests. Even taking an online course can boost your brainpower. Learn to play an instrument. If you missed out on lessons as a kid — or if you took lessons but hated them — try it as an adult and see how enriching it can be. Try a new hobby. Or restart an old one that you dropped when you got too busy! Volunteer. With digital tools, it’s easier than ever to find an opportunity that will truly put your talents to work for good. 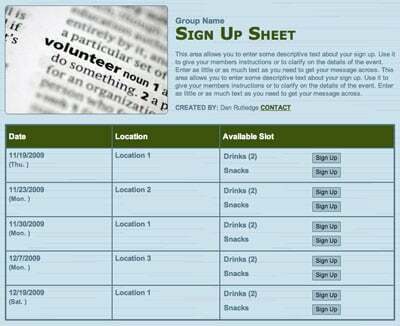 Genius tip: Recruit more volunteers for your cause with an online sign up that lets people pick the dates that work best for them. Schedule your doctor’s appointments. The annual physical, six-month dental checkups and all those health screenings they want you to have as you get older can seem like a lot. But if you get them scheduled at the beginning of the year for dates spread throughout the whole year it can be less overwhelming. Review your prescriptions. The average American adult takes more than four prescription drugs. If you think you’re taking too much, take an inventory before your annual physical and talk to your doctor. Go to a cultural event. Whether it’s a play, concert or an opera, nothing is as affecting as an in-person performance. Go to an art museum. Seeing the real-thing, up-close, is amazing. Buy a piece of original art. It doesn’t have to be expensive. Living with a one-of-a-kind, handmade item created by a professional artist can inspire you over and over again. Reconnect with an old friend. And not just on social media. 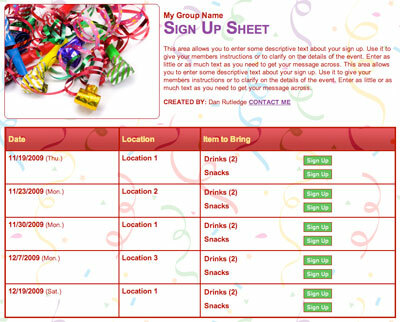 Plan a New Year's Eve party with an online sign up! SAMPLE. Write your will. It’s not fun, but — especially if you have kids — this is an essential task. Review your insurance. Life changes, and so do your insurance needs. Think about whether you need to increase your insurance coverage or buy a new type of insurance, such as long-term care. Back up your computer. Do it now and then make a plan for doing it periodically throughout the year. Consider one of the online backup services that will do it without you even having to think about it. Protect your cyber security. Make sure you’ve got the latest security software, web browser and operating systems installed. Clean out your pantry. How old are those spices you bought for that new recipe you wanted to try years ago? Give intentionally. Rather than donating to various causes on an ad-hoc basis throughout the year, make a plan for giving to causes that really square with your values and goals. Intentional philanthropy is more effective and satisfying. Read for pleasure. Especially if your job entails staring at a screen, it can be hard to pick up more reading material at the end of a long day. Pick something fun and short — don’t worry about impressing anybody with your literary taste. Read to your child. Even if — no, especially if — your child can read on his/her own, reading a book aloud is a wonderful shared experience. Go back to school. It really is never too late. Cook at home more. Even if you eat one less restaurant meal each week, you might be surprised at the money — and calories — you save. Coordinate a neighborhood hike with an online sign up! SAMPLE. Take that trip. You and your family don’t need more stuff. But you can always use more happy memories. Put your smartphone away. Promise yourself that you will not check your email or texts during meals. Get a pet. Sure, they can be a lot of work. But they can enrich your life immeasurably. Learn self defense. Even a single class can boost your self-confidence. Do one good thing for the environment. You don’t have to go all green. Take the bus to work one day a week or buy a programmable thermostat to up your energy efficiency. Try a new exercise. If you’re always on the treadmill (literally or figuratively) try the weight machines. Or vice versa. Do planks. Make it a goal to do one one-minute plank a day. Work toward a longer time if you think it will keep you motivated. Get more sleep. Adults should get between seven and nine hours a night, according to the experts, and Americans currently average 6.8 hours. Even an additional 20 minutes could make a difference to your health. Forgive yourself. If you mess up — like, say, breaking a New Year’s resolution — don’t beat yourself up. Reward yourself. Pat yourself on the back for the things you have accomplished. Small rewards along the way help you stay motivated! Go ahead, pick a resolution that is fun — or at least is small enough that you can see success on the horizon! You’ll be well on your way to having a fabulous new year. Jen Pilla Taylor is a former journalist and mother of two school-age children. These are great! Some very creative, inspiring and easy things to do! Thanks!